In the world of luxury watches, it’s difficult to find one that is as beautifully crafted and streamlined as the TAG Heuer Carrera Ladies Polished Steel Watch WV1414.BA0793. It is understated yet elegant, the true sign of TAG Heuer luxury. The black dial nicely contrasts with the baton-shaped silver hour markers, adding to the sleek and elegant look. 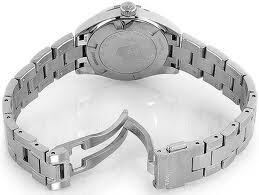 The open flange design allows the wearer to easily read minutes and seconds, making the watch quite functional in design. At the 3 o’clock marker, there is a date function, and beneath the 12 o’clock marker sits a clear TAG Heuer emblem. The classic style is also complemented by the polished steel case and link band. To give an ever-so-subtle contrast in the band, the outer rows of links are lightly brushed steel, and the middle row of links is polished steel. This level of care and craftsmanship again points to the quality of TAG Heuer watches. The only possible problem with this watch is that some women may not find it quite fancy enough. This watch is ideal for the woman who wants to pay for quality and function without sparkles or flashiness. However, the polished steel does act as a type of accessory, and the watch is gorgeous enough to be admired on its own merits. The Carrera has a retail price of $2,000, but it can be found at several online retailers for considerably less. Watches-Swiss.com has the lowest price at $1,081.00. However, there are a variety of more reputable retailers that can beat the retail price as well. These models are pricier because of the difference in size or the addition of diamonds. Overall, the TAG Heuer Carrera WV1414.BA0793 is a great watch for the no-nonsense career woman, simultaneously publicizing excellent taste and luxury while still providing the functionality a professional woman needs.